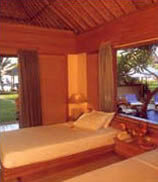 Puri Bagus Lovina is the first luxury hotel in the area. Built in traditional Balinese thatched roof architectural style on 20,000 square meters of land, beach front and offers 40 spacious villas, including two suites, each with private pool and outdoor dining room. Experience the unique Balinese life style in luxurious surroundings. Allow one of our 40 spacious thatched roof villas, set in 20,000 sq. meters of beautifully landscaped tropical gardens, to be your home away from home. The guests rooms offer touches of old Bali, such as large open air verandah and Balinese open air secluded showers in the privacy of interior gardens. All are tastefully blended with international standard facilities, bed-side control panels, individually controlled air-conditioning, radio, IDD telephone, cable TV, private mini bar - all clustered around spacious and beautifully landscaped tropical gardens. Enjoy the best of international cuisine at the open-air restaurant. Our popular Seafood Grill House offers you a range of delights taken daily from the sea. Relax with a tropical cocktail in the casual atmosphere of our bar. Other features include 24 hours room service, library, meeting room, boutique and specialty shop. For your recreation we have a natural spring water swimming pool, 200 meters of private beach, scuba diving, windsurfing, fishing.